Show Notes: Welcome to a another episode of Wildstorm Addiction, our resident Wildstorm experts Joe David Soliz & Benjamin Murphy review Midnighter #7 (2015). 00:00:01 – Ben welcomes everyone to episode #54 for December 2015. 00:00:38 – Ben continues with the obligatory spoiler alerts warning for the issue being reviewed along with some news just kidding). No listener mail this month. 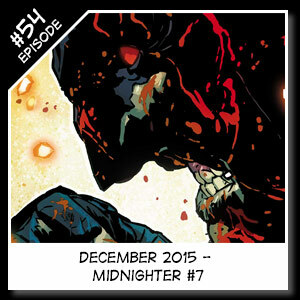 00:02:12 – Joe “reviews” Midnighter #7, released on December 2nd, written by Steve Orlando with art by ACO and Hugo Petrus, cover by ACO and Romulo Fajardo Jr.
For the week of 1/06 – MIDNIGHTER #8 – As he recovers from an assault that hit him harder than he ever could have imagined, Midnighter finds himself back in the sights of Spyral…but this time, they want him on their side! For the week of 2/03 – MIDNIGHTER #9 – Spyral wants the deadly Perdition Pistol back—so they turn to the only man who stands a chance of recovering it: Midnighter! The only problem is who has possession of it now…the near-unbeatable Suicide Squad! For the week of 2/24 – Grayson #17 – Wildcats cover!?!?! For the week of 3/02 – MIDNIGHTER #10 – It’s Midnighter versus the Suicide Squad, round two—unfortunately, Parasite came very, very prepared! Have they found a way to set a trap from which Midnighter can’t think his way out? 00:19:02 – Joe gives some quick shout out’s to the new Facebook version of the Clark’s Bar: https://www.facebook.com/groups/1036575389702716/, now with 16 members! We also want to mention our friends over at http://culturalwormhole.blogspot.com/ and their Valiant Future podcast where Joe has been a regular co-host for over a year now. 00:19:41 – Ben finishes up with the contact details as shown below.The opening music is “Universal Domain” by Dreamline. This entry was posted in DCU, Midnighter, Podcast and tagged ACO, Hugo Petrus, midnighter, podcast, Romulo Fajardo, Steve Orlando. Bookmark the permalink.